Author of Mind Mapping ebook Michelle Mapman is making a last call for her book promotion where Kindle readers can download it for free. The book is now leading as the top Study Skills book in the Kindle book store. 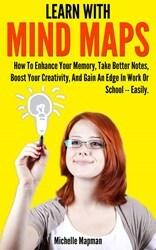 Students, entrepreneurs and anyone who wants to lead a more productive life are urged to take advantage of "Learn with Mind Maps - How To Enhance Your Memory, Take Better Notes, Boost Your Creativity, And Gain An Edge In Work Or School - Easily." The eBook is now available at the Amazon Kindle bookstore for free until 25 August 2013. Author Michelle Mapman has been using mind maps in her life and found them helpful even in everyday life such as organizing chores. With her book, she is inspired to share her success and help others be more productive and efficient in this fast-paced world. The eBook aims to help individuals organize their lives easily. Whether one is clueless about how to use mind maps, or is already using them, one can expect to find practical tips on enhancing memory, become more creative and perform better in work or school. Mapman aims to make her book a true value-for-money, as her mind mapping eBook comes with 1 year trial to ConceptDraw, a software that she herself is using to create her mind maps. At the time of this publication, the book is known to be at position #209 in the Amazon Best Seller Ranks. More information about how mind mapping can help boost your study skills, visit this link to download it now before it reverts back to its original price.